So the 51st Baeksang Awards ceremony took place today. I can’t speak for the movie categories seeing as I’m more of a drama person but seriously, Ji Sung was robbed. As much as I like Lee Sungmin that Best Actor award had Ji Sung’s name etched on it. And yet, he lost out. I wonder why fair award shows are such a rarity regardless of what country you look at. Rather than one drama sweeping all the awards, seeing as how many great shows aired the last year, I’d have thought that whoever the numbskulls are who decide the winners, would have spaced things out well. An award for Misaeng, an award for Punch, an award for It’s Okay It’s Love, an award from Heard it Through the Grapevine, an award for Kill Me Heal Me. Because these were the top five dramas of the previous year. But nope, apparently fairness is out of the question, because Kill Me Heal Me walked away with nothing that night. Now I’m not say that it should have won Best Drama or Best Screenplay or Best Director because my bias aside, I’m objective enough to know that there were superior contenders. But Best Actor? That had Ji Sung’s name on it. Honestly, did Misaeng really need another award? The fellow rising up the search rankings every Wednesday and Thursday was Ji Sung. And he wasn’t the only actor subject to unfairness as Kim Raewon walked away with nothing as well. Ugh, I’m irritated. At least there’s the end-of-the-year MBC awards, the APAN awards and the KDA. He better get two Daesangs like his wife did, so they can sit together on the family trophy cabinet. 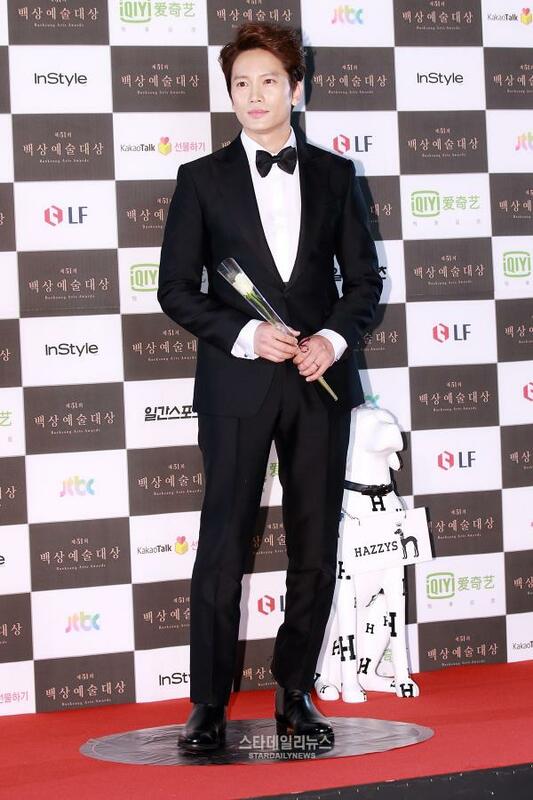 On a sweeter note, MC for the night, Joowon, named Ji Sung as his role model when he gets married. He asked Ji Sung to say a few words to wifey Lee Boyoung, no doubt nervously watching him on-screen. Ji Sung, being the lovely man he is, merely smiled and said “I’ll be home soon.” Awww!! No doubt Ji Sung doesn’t need the award, seeing how high his star is, but there’s no doubt that he deserves one. Ah well, he can add being a Baeksang nominee to his long list of accomplishments now and return home as quickly as he mentioned. Here’s hoping that other award ceremonies will be much more fair. Ugh I couldn’t agree more…….. I was so disappointed that Ji Sung did win anything…. Ji Sung Hwating!!!! I was also expecting Ji Sung to take home something. He truly should have been recognized as he did an incredible job portraying all his characters. He was completely shut out. He was sitting all the way in the back with only 2 people at his table of 10 while more influential people were in front. Not sure if it is Korean culture to give grand prize to PD that produces successful shows or reward an actor that did phenomenal acting. You’re absolutely right. I noticed that he was sitting next to Shim Eunkyung but didn’t see anyone else of import either. Considering that Ji Sung is a veteran of 15 years now, you’d think they’d accord him more respect. I really wish Korea could differentiate between popular actors and good actors. I still don’t seem Lee Minho and Park Shinhye as having done anything all that special to deserve every award in history, besides being good looking and publicly nice people. I believe the MBC end of the year awards will be much more fair, seeing as neither LMH, LJS or PSH will be there. Angry Mom Kill Me Heal Me and Ji Sung deserve every award they get!